Sun., Jan. 14, 2018, 9:35 a.m.
TEMUCO, Chile – When Pope Francis visits the de facto capital of Chile’s Mapuche people, he will be inserting himself into one of Latin America’s longest-running conflicts involving indigenous populations, and one that periodically erupts in violence. Leaders of both the Mapuches and the Chilean government have said in recent weeks they hope Francis can facilitate dialogue on disputes dating to the late 19th century, when the Mapuches, known for their ferocity resisting Spanish and other European settlers, were definitively defeated by the Chilean military. At stake are many thorny issues: ownership of ancestral lands in the southern Araucania region, legal recognition of the Mapuches’ language and culture, and discrimination that their leaders say permeates all facets of life. How far the pope goes in any statement supporting the Mapuches will be closely watched, and even fretted over. Francis, a native of neighboring Argentina and the first pope from Latin America, has shown strong support for indigenous peoples during visits in other countries. In Bolivia in 2015, he went so far as to apologize for the Roman Catholic Church’s “grave sins” committed against indigenous communities during the colonial era. His visit to Temuco on Wednesday takes him to a region of high volatility. While the vast majority of Chile’s estimated 1 million citizens of Mapuche descent oppose using violence, a small number use it to push their agenda. In recent years scores of churches have been among the targets – including three firebombed Friday in the nation’s capital, Santiago. Like in previous incidents in Araucania, pamphlets extolling the Mapuche cause were found at the scene of one of the churches, though no arrests were made and no group has claimed responsibility. 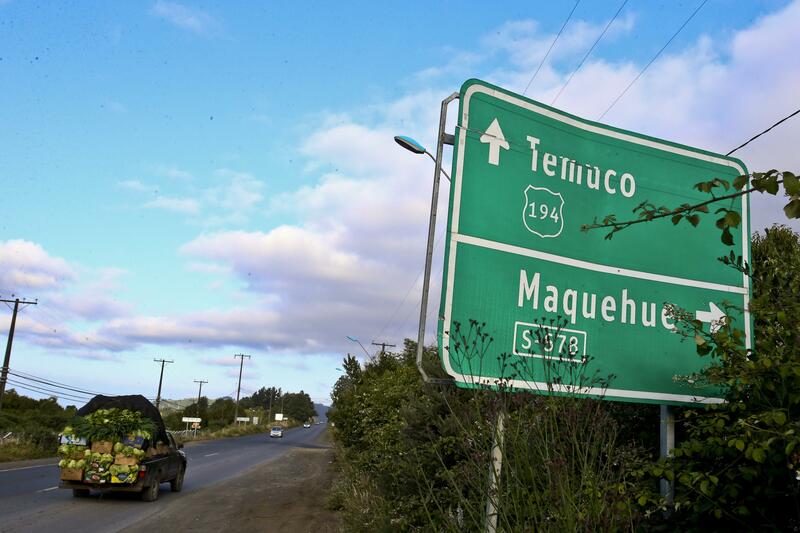 Protests are expected in Temuco, including outside the Maquehue Air Base where the pope will celebrate Mass. It was built on land that was taken from Mapuches in the early 20th century and remains a point of friction. Chilean authorities plan to deploy more than 4,000 police officers in Temuco’s streets as, flanked by 16 police vehicles, Francis rides in the popemobile down a central avenue before visiting an order of nuns. A Mapuche choir will participate in the Mass, and afterward the pope will have lunch with a group of Mapuches hand-picked by local bishops. Fernando Diaz, a priest in the Temuco area who has worked with Mapuches for years, expressed disappointment that Francis is not scheduled to meet with any of the leaders of the cause. “The visit has been planned so the pope sees as little of the reality as possible,” Diaz said. Massimo Faggioli, a Vatican expert and theology professor at Villanova University in Philadelphia, said every papal visit disappointments someone over who gets or does not get an audience, but the pope generally finds a way to carve out time for what is important to him. “Usually Francis has a good ear and tries to adapt,” said Faggioli. The first papal visit to Chile since Saint John Paul II in 1987 comes as the Catholic Church’s role with indigenous peoples in the Andean nation of 17 million people has shifted. During the 1973-1990 dictatorship of Gen. Augusto Pinochet, many Chilean bishops pushed to protect native peoples and get their cultures recognized. But today the hierarchy is much more aligned with business interests. In 1987, John Paul II gave a pointed nod to Mapuches that surely prompted cringes within Pinochet’s government, which was unsympathetic toward indigenous groups and cracked down on any form of dissent. During his homily, John Paul said faith in God could overcome all human-caused problems, implicitly referring to friction between Mapuches and the Chilean state. Since then, the Mapuches have made significant strides. The return of democracy in Chile in the 1990s set the stage for creation of a government body, the National Corporation of Indigenous Development, that is dedicated to issues related to the country’s native peoples and spurred many changes. Some ancestral lands have been returned. University scholarships have been set aside for Mapuches along with other benefits not open to all Chileans. Various aspects of Mapuche culture, such as many foods, have become part of the mainstream. Still, problems persist, ranging from economic to social. Araucania remains the country’s poorest region, and Mapuches complain of frequent abuse at the hands of security forces. One case that reverberated strongly in the community involved the arrest of two Mapuche brothers, ages 13 and 17, while police were searching for five wanted Mapuche men in December 2016. The 17-year-old, Brandon Hernandez Huentecol, was shot in the back by a police officer while face-down on the ground, resulting in a nearly two-month stay in the hospital and several surgeries for a shattered pelvis. The officer has not been charged and failed to appear in court in response to a summons to testify. Over a year later, the boy’s mother is beseeching Francis to bring his influence to bear. Published: Jan. 14, 2018, 9:35 a.m.